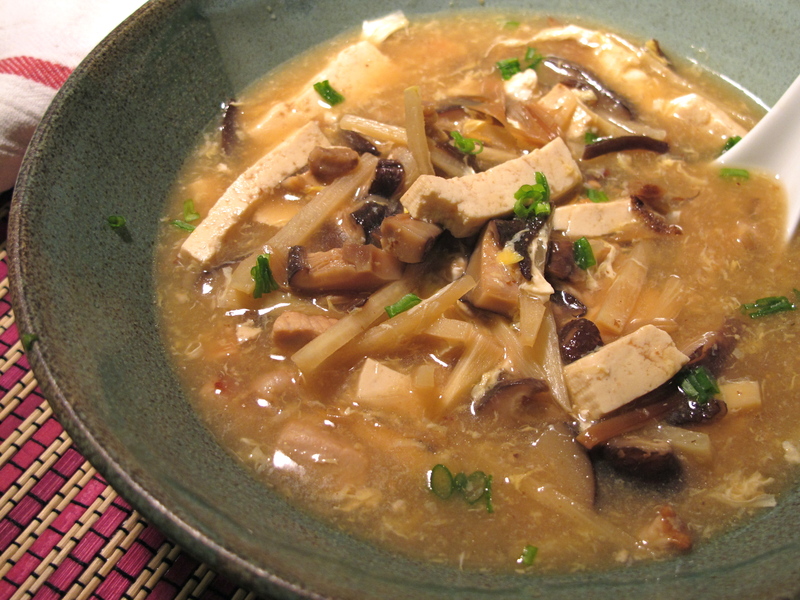 Starve a fever, feed a cold, and Hot and Sour Soup allergies? I don’t know if it’s because of the unusually mild winter we’ve had this year, but we have been just sucker-punched by allergies this year. It’s just been non-stop sneezing, sniffling, congestion, and dark circles under puffy eyes for the last several weeks. My most irritating symptom has been that my right eyelids have been constantly twitching unless I take allergy meds, and Scott’s has been a nagging sore throat. Chicken soup is a lot of people’s idea of the perfect anodyne for illness, but when we’re under the weather we both crave fortifyingly spicy Asian soups like Thai tom yum with lemongrass, Vietnamese pho with sriracha and chiles, or Chinese hot and sour soup with vinegar and white pepper. Hot and sour is especially good in the winter; maybe because it’s a bit thicker than the clear broths of tom yum and pho, it seems to stick to your ribs on a cold night. I have always had hot and sour as a first course soup in restaurants, but this home-made version is a meal in and of itself. I recommend eating it in your comfiest and least flattering pajamas. This recipe might be a little intimidating at first because of the exotic ingredients, but it is really just pantry cooking. I get the dried mushrooms and lily buds at an Asian market and keep them all together in a container (they keep indefinitely) like an emergency hot and sour soup kit for next time I’m in need. Since you only need a few each time, a package of dried mushrooms will be enough to make a year’s worth of soup. Vinegar, soy sauce, and canned bamboo shoots are all things you’ll have in your pantry if you ever cook Chinese food. And I buy a few thin-sliced lean pork chops, use one for the soup, and freeze the rest individually for next time. I always have eggs and chicken broth around so tofu is usually the only thing I need to buy fresh. The dried shiitake mushrooms can often be found in regular supermarkets, so if you have trouble finding the wood ears and lily buds, just add a few more shiitake to the soup and skip the harder to find ingredients until you happen run across them. I love all of the elements of this soup, but the earthy meaty richness of the shiitake is an essential element to me. Pour boiling water over the dried shiitake, wood ear mushrooms, and lily buds and allow them to rehydrate for 20 minutes. Drain, reserving about 1 cup of the water. Some shiitake mushrooms are a little gritty, so if you notice that sediment has settled to the bottom, strain it through a fine sieve or coffee filter. Trim the tough stems from the shiitake mushrooms and then slice them into thin slivers. Cut the lily buds in half and pull them apart into long shreds. 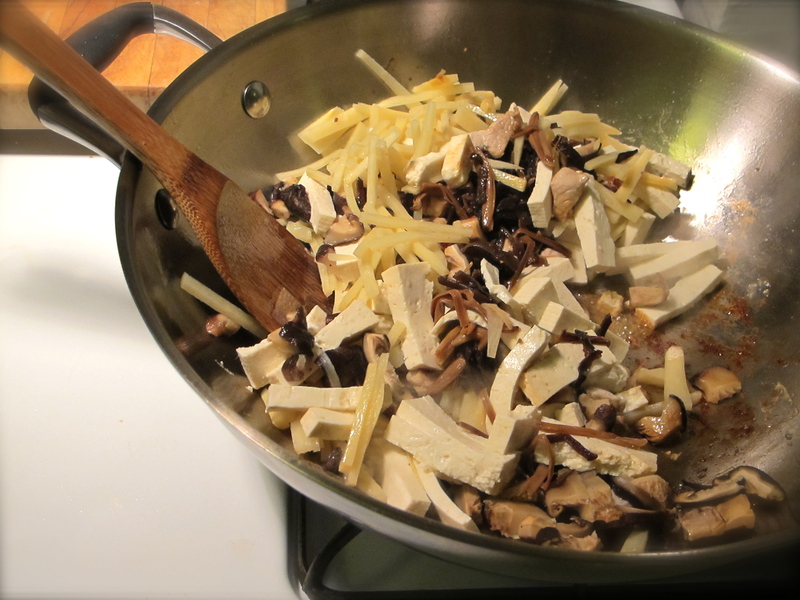 Set the mushrooms, lily buds, strips of bamboo shoots and tofu aside. Measure and mix the vinegars and soy sauce into a small bowl or ramekin. Beat the egg in a small bowl too. Stir the cornstarch into the cooled reserved soaking water. A note about the cornstarch: the thickness of the soup is a matter of personal preference. The thickness of the soup can adjusted but it’s a good idea to start small and work thicker a teaspoon at a time after the soup has simmered and thickened. I’ve given amounts for a lightly thickened soup. If you want to add more, mix a teaspoon of water at a time with a splash of cold water and stir it into the soup until it’s thick enough. If you have arrowroot, it is actually a better thickener for this application since it stands up to acid and heat better than cornstarch, but it’s less common, so I’ve called for cornstarch instead. Once you have your mis-en-place in place (ha) fry the pork in about a teaspoon of oil in a wok or pot over medium high heat until it begins to brown. 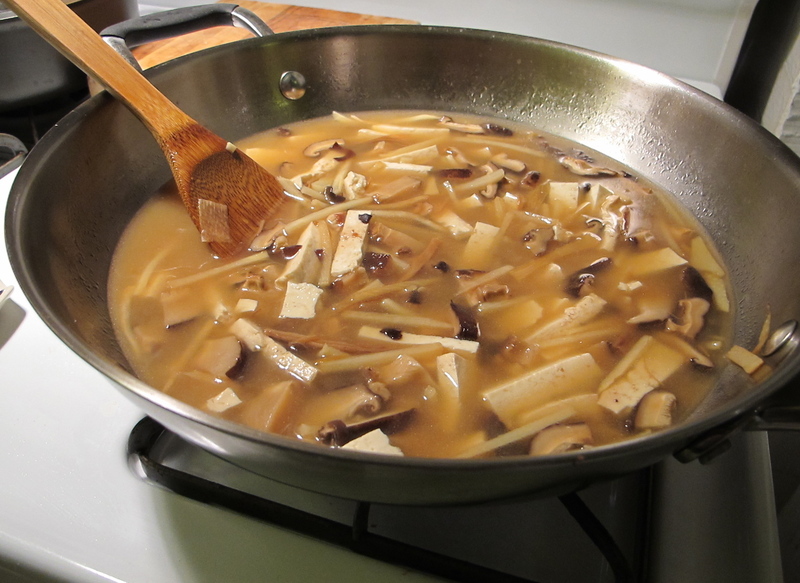 Lower the heat and add in the mushrooms, lily buds, tofu, bamboo shoots, and vinegar mixture. Stir in the chicken broth and bring everything to a simmer. Stir in the water and cornstarch mixture; as the soup returns to a simmer, the cornstarch will thicken it. Now is the time to decide if you want to thicken the soup a little more. If so, add the cornstarch slurry a teaspoon at a time, simmering between additions until it’s thick enough. Once you’re happy with the consistency, mix in the pungent white pepper. With the soup at a low simmer, pour the egg in a thin stream into the soup while stirring everything in a circle. The egg will cook instantly, making white ribbons throughout the liquid (this is the same way you make an egg drop soup). Turn the heat off right away. Ladle into big bowls and sprinkle thin slivers of scallions over the top.